Its name comes from the Latin sÄ«rius, from Greek ÏƒÎµÎ¯Ï�Î¹Î¿Ï‚ (seirios, "glowing" or "scorcher"). As the major star of the "Big Dog" constellation, it is often called the "Dog Star". Sirius can be seen from every inhabited region of the Earth's surface and, in the Northern Hemisphere, is known as a vertex of the Winter Triangle. At a distance of 2.6 pc or 8.57 light years (50.3 trillion miles), Sirius is also one of the nearest stars to Earth. The best time of year to view it is around January 1, when it reaches the meridian at midnight. It is a main sequence star of spectral type A0 or A1 and has a mass about 2.4 times that of the Sun. 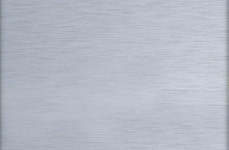 It is also known by the Latin name Canicula ("little dog") and as Ø§Ù„Ø´Ø¹Ø±Ù‰ aÅ¡-Å¡iâ€™rÄ� in Arabic astronomy, from which the alternate name Aschere derives. In Chinese culture, the star is known as å¤©ç‹¼æ˜Ÿ (literially, heavenly wolf star). Its closest large neighbour star except Sirius B is Procyon, 1.61 pc or 5.24 ly away. In 1909, Ejnar Hertzsprung suggested that Sirius was part of the Ursa Major Moving Group; however, more recent research by Jeremy King et al. 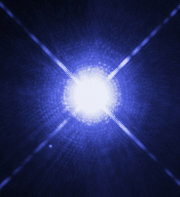 at Clemson University in 2003 questions whether that is true, since the two components of Sirius appear to be too young. In 1844 Friedrich Wilhelm Bessel deduced that Sirius was actually a binary star. 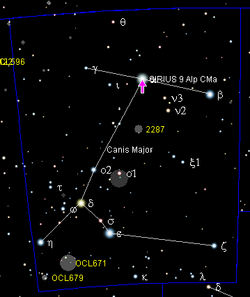 In 1862 Alvan Graham Clark discovered the companion, which is called Sirius B, or affectionately "the Pup". The visible star is now sometimes known as Sirius A. The two stars orbit each other with a separation of about 20 AU and a period of close to 50 years. In 1915 astronomers at the Mount Wilson Observatory determined that Sirius B was a white dwarf, the first to be discovered. Interestingly, this means that Sirius B must have originally been by far the more massive of the two, since it has already evolved off the main sequence. Robert Hanbury Brown measured the diameter of Sirius for the first time in 1956. In 2005, using the Hubble Space Telescope, astronomers determined Sirius B to be 12,000km (7,600 miles) in diameter, with a mass that is 98% of the Sun. Historically, many cultures have attached special significance to Sirius. Sirius was worshipped as Sothis in the valley of the Nile long before Rome was founded, and many ancient Egyptian temples were oriented so that light from the star could penetrate to their inner altars. The Egyptians based their calendar on the heliacal rising of Sirius, which occurred just before the annual flooding of the Nile and the Summer solstice. In Greek mythology, Orion's dog became Sirius. The Greeks also associated Sirius with the heat of summer: they called it Î£ÎµÎ¯Ï�Î¹Î¿Ï‚ Seirios, often translated "the scorcher." This also explains the phrase "dog days of summer". Prices current as of last update, 04/17/19 9:50pm.